Not only do I get to be a food blogger and create easy, delicious recipes for my online friends, but I occasionally get to bake for people in real life too! This past year I’ve ventured out into doing dessert catering. Recently, I was asked to cater a baby shower. One of my close friends was throwing a baby shower with a friend of hers FOR a friend of theirs. Wait, hang in there…it gets less confusing, I promise. Let me just say, the two gals throwing this shower outdid themselves! I guess you can tell it was a baby shower for a girl. A sweet baby girl, to be named Kanella (a Greek family name). That’s me up top there surrounded by all my treats I made for the shower. One of the cutest things they did though, in the bottom right corner, is to give each guest a scrapbook page where they write down their wishes for the baby…wishes like, what do you hope the baby learns, loves, respects, looks like, etc… VERY cute idea! Each page then goes into a scrapbook they provided the mom-to-be. All the gorgeous flowers came from one of the mother’s gardens. Just beautiful. I created the burlap banner with Kanella’s name on it. One of the few crafts outside of the kitchen I’m capable of doing! As a party favor, each guest took home a decorated sugar cookies, with a “K” for Kanella, of course! 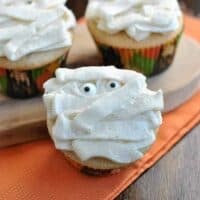 I also made these delicious Vanilla Bean Cupcakes with Vanilla Bean Buttercream frosting. The rich vanilla flavor is just over the top delicious. I use vanilla bean paste in this recipe. I LOVE VANILLA BEAN PASTE. Like a lot. I order mine HERE from Beanilla. I also get my vanilla beans from there as well! So worth it. The paste I buy two bottles at a time. Thanks again Jennifer and Katie for sharing pictures from this special day. 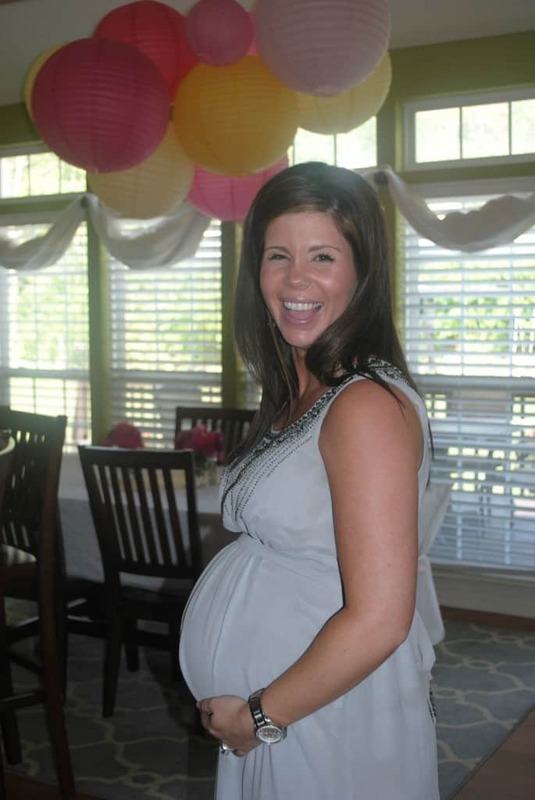 Congrats Krista on your baby girl!!! 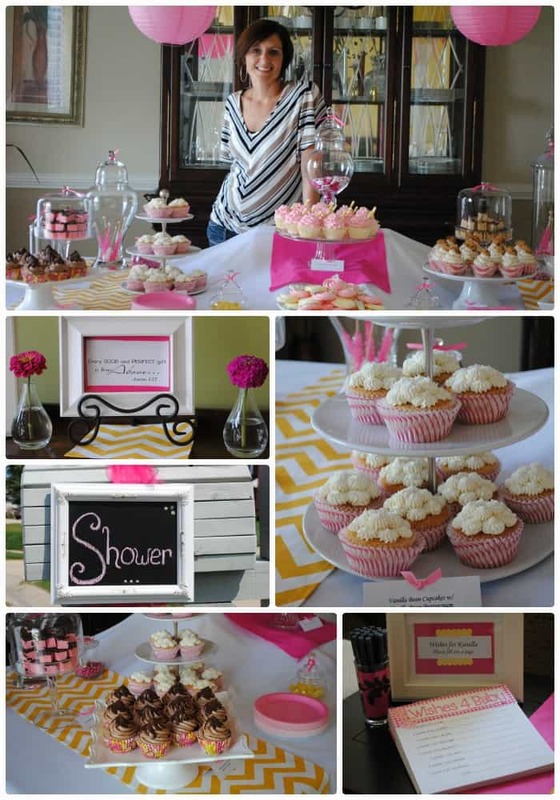 awww what a beautiful job you did for this baby shower!! 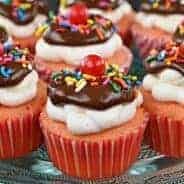 everything looks so delicious and your cupcakes were beautiful! Wow you did a great job, love those vanilla bean cupcakes I know they were YUMMY! Such a pretty shower! Those cupcakes are amazing, and all the touches you did with the treats. I want to do dessert catering too – but it’s so nerve-wracking! My peppy Michael Buble swing soundtrack came on just as I was reading about this dainty day–what fun! Amazing job with the catering; you go live the dream, girl! Wow, Aimee! That dessert table looks so professional and beautiful; I love it! Those cookies are beyond adorable and the cupcakes look DELISH. 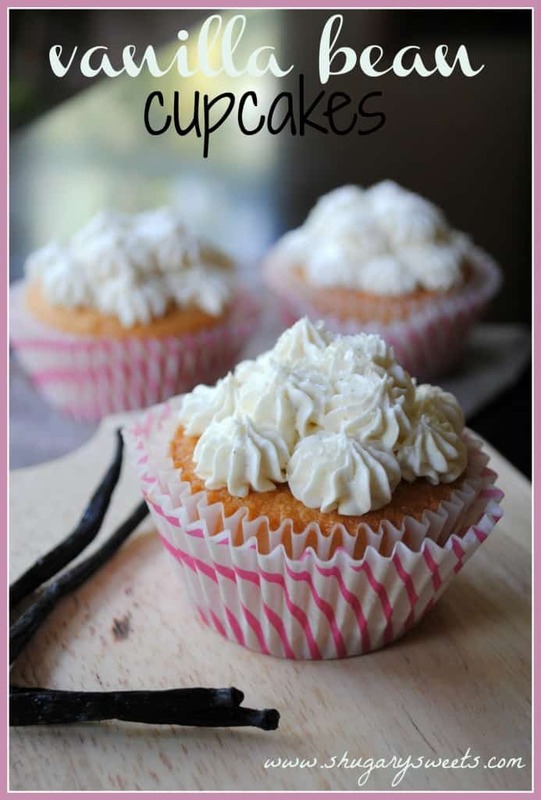 Vanilla beans are definitely one of my favorite ingredients to use! you make THE BEST cupcakes! They are always just stunning! 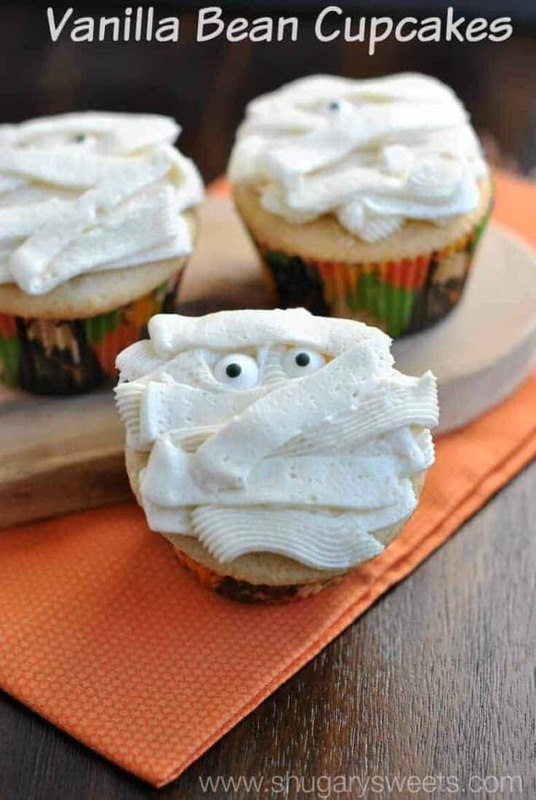 Can you come to Cali and please give me a frosting-application tutorial b/c seriously, yours are always…PERFECT! Averie, I’ll give ya a call next time I come out that way 🙂 Thanks for the sweet words! The day Jenn told me you were pregnant was a blessed day! I had been praying for you, and still do! You deserved every special touch those ladies put on for you, and much more!!! It was an absolute delight to be asked to help out! We would TOTALLY be awesome partners! Need I remind you there are plenty of houses for sale in my town! What a lucky mom to be (and the party guests!) What a wonderful party! You outdid yourself! 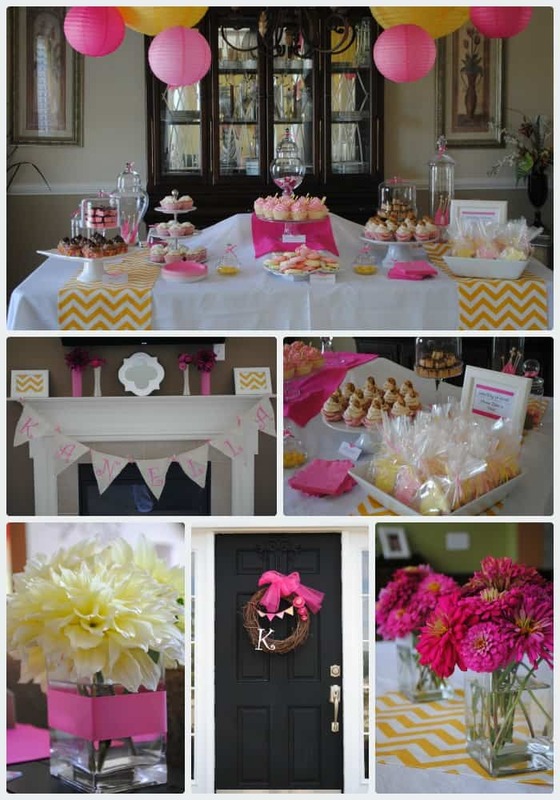 The decorations the food and your cupcakes are just beautiful! I love it! I have to check out all of your recipes! I will have to order some vanilla bean paste now. Thanks. Wow! I bet that was the happiest party eva!!! Great job and choices. And your photography is amazing! High fives. Sarah from The Ease of Freeze. So sweet, lovely, and luscious! All of your treats look amazing! OK, this is just an overload post! I was loving these vanilla cupcakes, then you had to show me everything else you made! I’ve pinned the 2 fudges and I don’t know if I can wait for you to share those chocolate cupcakes. I feel like the lady in those old K-mart? commercials standing at the door waiting for them to open, open, post, post, post the recipe! Yum! I love baby showers anyway, but you’ve made this one extra special. Nice work! 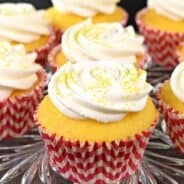 What a darling post and delicious recipes! That mama-to-be musta been out of her head thrilled with all the special touches in honor of her baby. The onesie cookies are just adorable – I already pinned that yummy cherry fudge, etc. etc. WOW! Much success to you as you do catering – you certainly have a talent! Thanks so much for linking this post up at Weekend Potluck. This all looks just fantastic Aimee! I think I gained 10 pounds looking at the beautiful pictures! I love the idea of the scrapbook pages, what a terrific party. Congrats on being one of the features at the Weekend Potluck. Have a terrific weekend! I have been looking for a long time for a white cake made from scratch that tastes like a cake mix. Might this be the one??? 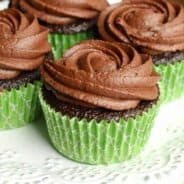 If I were to use vanilla extract instead of vanilla bean paste, how much should I use? Can you make this as a cake as well? And if so, will it be enough for two pans? Amazing, awesome, astounding, adorable & that’s only the ‘A’s…covered. This Baby-Shower is a ‘Feast for the eye’s’ & the taste-buds. What a marvelous selection of cakes, bakes & treats, you should be very proud of yourself. You’ve certainly made this a day to remember for all concerned, it is wonderful, well done! You’ll get plenty of other orders for your catering talent judging by this splendid array of party food that’s shown here & deserve it too, it all looks so inviting, professional, perfect, you’ve even made the beautiful banner. Many thanks for sharing this special day, filled with so much beauty, love & dedication.